Former Greek finance minister Yanis Varoufakis has launched a pan-European movement designed to “democratize” the EU within a decade. Naomi Conrad reports from Berlin. Deutsche Welle. Tuesday’s event at Berlin’s imposing Volksbühne, famous for its long tradition of radical left-wing productions, had been long sold out. Yanis Varoufakis, a self-proclaimed “erratic Marxist” who promised to take on the European Union was the reason for the rush. It was his “duty” to do so, he told a packed audience. Otherwise, the EU would “disintegrate”. The economics professor rose to fame when he was appointed as finance minister by Greece’s left-wing Syriza party last year. He famously clashed with his German counterpart Wolfgang Schäuble, as he tried to defy German-backed European austerity policies. Finally, with a third bailout on the table, which imposed further rather than less austerity measures, Varoufakis resigned his post and broke with Syriza. But now the economist turned maverick politician is trying to reclaim the political arena with Berlin launch of his grassroots pan-European movement. 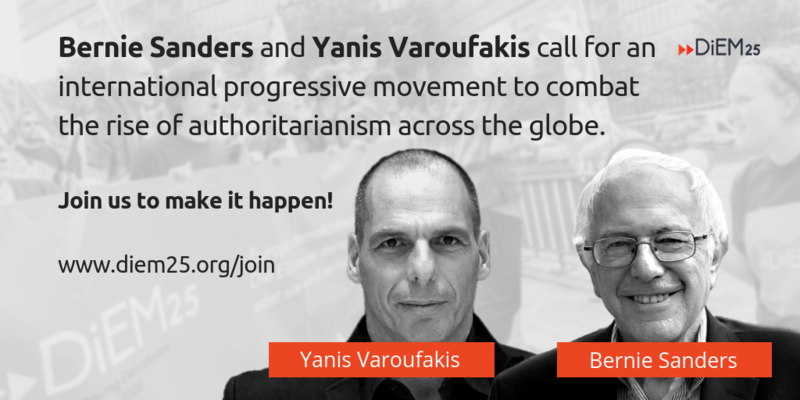 Varoufakis calls the movement “a broad coalition of radical democrats,” which intends to “democratize” the European Union – and indeed revolutionize the 28-member bloc. Former Greek finance minister Yanis Varoufakis has launched a new pan-European umbrella group that aims to pull together leftwing parties, grassroots protest movements and “rebel regions” from across the continent. He was joined on stage by leader of the left-wing party “Die Linke,” Katja Kipping, British MP Caroline Lucas and Irish MEP Nessa Childers, among others. The movement is not without its critics: In an open letter published on his website, Sven Giegold, a member of the European Parliament for the Green Party, called Varoufakis’ comments “disrespectful and populist.” He also slammed the manifesto for lacking transparency, pointing out that it was unclear who decided on the final version of the document. But nevertheless, the number of those who signed up to the petition continued to grow on Tuesday evening. By late evening, more than 3,200 people had signed up. At the launch on Tuesday night, Varoufakis said that the new DiEM25 movement would “shake Europe – gently, compassionately, but firmly”. “Europe will be democratised, or it will disintegrate, and it will do so quite fast”, the self-described “erratic Marxist” said, warning of a return to a “postmodern version of the 1930s”. The evening at Berlin’s Volksbühne theatre, also featured speeches from Barcelona’s mayor, Ada Colau, British Green MP Caroline Lucas, representatives of Germany’s Blockupy movement, as well as musician Brian Eno, philosopher Slavoj Žižek and WikiLeaks founder Julian Assange. “When parliaments become theatres, we have to turn theatres into parliaments”, said Miguel Urbán Crespo, an MEP for Spain’s Podemos party. “Our medium-term goal is to convene a constitutional assembly where Europeans will deliberate on how to bring forth, by 2025, a full-fledged European democracy, featuring a sovereign parliament that respects national self-determination and shares power with national parliaments, regional assemblies and municipal councils”, said the economist academic, who resigned from government in July last year after a series of run-ins with other European finance ministers. In the run-up to its launch, DiEM25 drew some criticism from activists, some of them asking whether it represented an agenda already covered by other pro-transparency and anti-austerity party groups in the European parliament. Sven Giegold, a German Green MEP, called Varoufakis “populist and disrespectful” in an open letter. In another open letter, a Blockupy activist criticised DiEM25 for charging €12 (£9.30) for its launch event. Neue Bewegung beginnt Debatte über Demokratisierung der EU von unten / Warnung vor neuem Nationalismus. This is important: A Critique Of Yanis Varoufakis’ Democracy In Europe Movement (DiEM25) Thomas Fazi on 9 February 2016. Before reading this it is well to bear in mind that Fazi avoids the potentially dangerous trap of talking about “sovereignty”. How many gallons of pen, Biro and printers’ ink have been spilt over the idea of that a sovereign ‘general will’ is the basis of democracy will never be counted. As a philosophical construct it has never been pinned down. It took a liberal Benjamin Constant to point out in the 19th century that Rousseau’s concept had never been seen in the flesh for all its rampages in the mouths of politicians (Principes de politique applicables à tous les gouvernements représentatifs. 1815). The sovereignty of Nations should have gone the way of Sovereigns. That it s a Monster, something we glimpse out of the corner of the eye in books, is all too rapidly seen when rears its head as a blood spitting beast in Wars. Its use is doing intolerable damage to debate about the European Union. Democracy, the free capacity to make, through majorities, through voting, collective decisions, is about majorities, and mundane institutions, not abstractions, nations and Sovereignty. Marx and Engels always saw the two sides of the complex of democratic institutions and rights which arose under bourgeois democracy. The two sides corresponded to the two classes which fought it out within this framework. One side was the utilization of democratic forms as a cheap and versatile means of keeping the exploited masses from shaking the system, of providing the illusion of participation in the state while the economic sway of the ruling class ensured the real centres of power. This was the side of the “democratic swindle”. The other side was the struggle to give the democratic forms a new social (class) content, above all by pushing them to the democratic extreme of popular control from below, which in turn entailed extending the application of democratic forms out of the merely political sphere into the organization of the whole society. Marx on Democratic Forms of Government. Hal Draper. 1974. …much as I share the movement’s spirit, I also consider its strategy and general goals – as presented in the manifesto and in various interviews by Varoufakis – to be rather problematic, for reasons that I will try to explain. The idea that the European Left should aim for a radical, progressive overhaul of Europe’s institutions – rather than their rejection – is not new, of course, and has actually been the consensus among European progressive/leftist movements all throughout the crisis – and still i.s, I would imagine, despite the recent rise of left-wing euro-scepticism. “In general terms, they point to a wider crisis of electoral-representative democracy. It is widely agreed that in recent decades we have witnessed a ‘hollowing out’ of democracy and sovereignty at the national level. In the long-established democracies of Western Europe, electoral turnouts are in decline and membership is shrinking in all major parties. This is particularly evident in Europe, for obvious reasons. Colin Crouch coined the term ‘post-democracy’ to describe this new normal, defined as a society that continues to have and to use all the institutions of democracy, but in which they increasingly become a formal shell, and the energy and innovative drive pass away from the democratic arena and into small circles of a politico-economic elite. There are generally two ways of framing this phenomenon. One is that this is a somewhat inevitable – one may even say ‘natural’ – result of economic and political internationalisation, which has seriously eroded the ability of individual countries to decide their own destinies, and thus of national electoral-representative systems to formulate a general will that can bend the institutions of public power to sovereign ends. According to this narrative, the shift – in the European context – from a multiplicity of (increasingly powerless and non-sovereign) national democracies to a single (and truly sovereign) European supranational democracy is inevitable, whether we like it or not. This really is a big issue. But internationalists have no way of avoiding the issue: is super, or supra-national democrcay possible? I am not sure about “post democracy”, undemocratic would be a better term. Or, to put it bluntly: what political forces can DiEM25 muster behind itself? DiEM25’s manifesto offers little insight as to the position that European progressive movements should take with regard to the authoritarian, top-down ‘federal’ integration being proposed and pursued by the EU establishment (exemplified by Schäuble’s proposed ‘fiscal union’, for example). Would Varoufakis agree with the notion that any further integration should be considered desirable only if, when, and to the extent that it is accompanied by the enhancement of popular control at a local, national, and supranational level, and that the current processes of top-down integration should be opposed? Which leads back to the issue already signaled: the need for a left majority in Europe remains in the shadow of an embedded policy of monetary orthodoxy. How to shatter that is, to say the least, a major problem. One thing is certain: in the UK leaving the European Union with an even more entrenched orthodox economic framework intact with the hard-right even more in the ascendant, will make challenging it much much harder. L’ex-ministre des finances grec Yánis Varoufákis lance un nouveau mouvement européen. 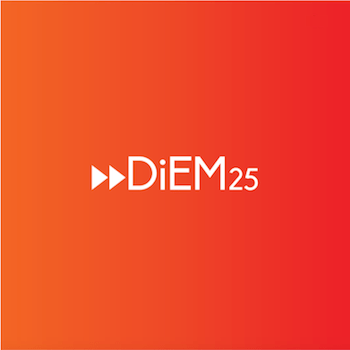 DIEM25 entend revitaliser l’espoir démocratique en Europe en fédérant les consciences politiques de la société civile sur le continent, dans l’esprit cosmopolitique du projet de paix perpétuelle hérité des Lumières.